This is one of those books that I picked up again and again, and ended up buying all of the copies in paperback. Then boxed them up. Somewhere. Now that there is a new book out in the series, I wanted to read them again. And they’re on ebook so it’s much easier to buy a copy than to sort through boxes of paperbacks. I don’t know why I never read it before. I think maybe I didn’t want to get hung up in the middle of a series, as so oftentimes happens. Jennifer Roberson first caught my eye with her Cheysuli series (loved those early covers) but I liked the idea of the ongoing saga of Tiger and Del. When I finally opened the ebook and settled in to read, I knew at once I was in good hands. 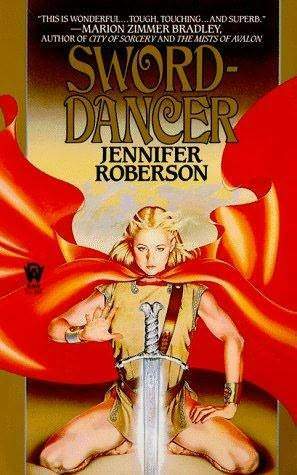 Roberson’s story isn’t anything we haven’t seen before, but back when it was published in 1986, the fantasy wasn’t used to seeing strong-willed women capable of saving themselves. C. J. Cherryh was breaking new ground with her books, but things just weren’t equal back then. Which is why, I suppose, Roberson chose to tell the story through Sandtiger’s eyes instead of Del’s. The first-person narrative smacks of a lot of books I’d read before, stretching back to Edgar Rice Burroughs’s John Carter novels to Lin Carter’s fantasy book that were contemporary when this novel was first released. There’s nothing flashy or sophisticated about Sword-Dancer. It’s a sprawling book that’s as much sword-and-planet storytelling as it is fantasy. In fact, I’d say it’s much more like those old adventure serials that used to pop up on Saturday mornings than anything remotely like The Lord of the Rings. I enjoyed the view I had of Sandtiger’s Southron world, of how inhospitable the land and the climate were, and of the various tribes and cities that survived in spite of the heat and the sand. The characters rode from one frying pan to the next with a strong development of character and a gradual release of the mysterious pasts of both. The book spans more time than most fantasy novels do these days, unless they’re doorstoppers like George R. R. Martin or Robert Jordan’s series. The action is paced out well and I zipped through the pages at a good clip. I wished there had been a bit more exploration of some of the cities, but there really wasn’t time. Tiger and Del are pragmatic characters, dealing with harsh circumstance and even disappointment as they search for Del’s missing brother. One of the most enjoyable aspects of the book is that it truly does stop at a good place in the narrative instead of forcing you on into the next book. Of course, I’m wondering how Tiger will fare once he’s out of his native element in the sequel, but I got a finished story in this one. These days, filled with cliffhanger opuses, I was happy to leave the characters in a good place till I take up the next book – and I will be reading it soon. This entry was posted on April 20, 2013 at 4:57 am and filed under Adventure,fantasy,series fiction. You can follow any responses to this entry through the RSS feed. You can leave a response, or trackback from your own site.